You must make reservations at least 5 minutes in advance of the time at KoFusion. Metered public parking lot and garage parking on Neil Street. Two blocks from the Illinois Terminal. 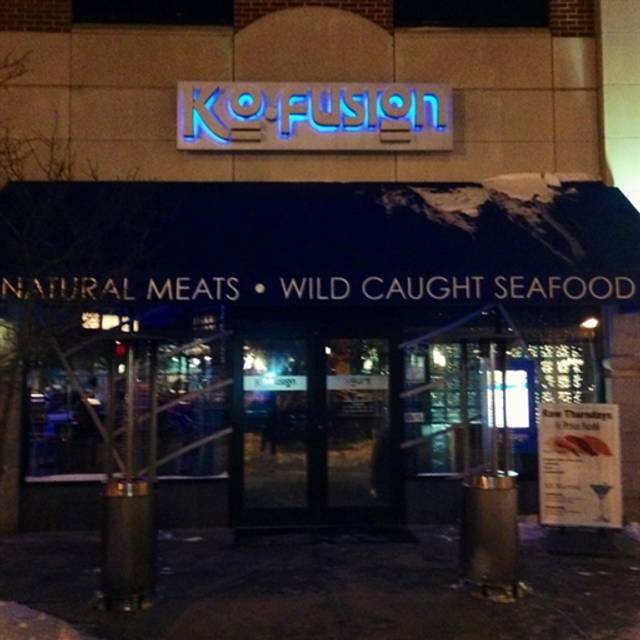 KoFusion proudly serves natural meats, wild caught seafood and local produce. Our menu features both signature sushi and a unique blend of Contemporary American and Asian cuisine. We have an extensive beer and wine menu and offer a full array of sakes and house cocktails. In addition to fine dining table service, our stunning space houses a drink bar, sushi bar, private party room and seasonal outdoor seating. KoFusion delivers a truly unique experience in the heart of downtown Champaign. Great lunch buffet with good value. Enjoyed the fish tank with changing lights. Love Ko fusion as it is our always go to whenever we visit our daughter at u of I! Always delicious, beautifully presented and positively memorable. Nice food overall, but service really needs work. Upon initial seating, we waited over 10 minutes while waitstaff ignored us. Had to ask multiple times for water, refills, etc. They seemed disorganized. Food was great, though, so I think the service issues were an aberration. Always an awesome experience? Great food, service & location. Our go to whenever in Champaign! Great, but the table jammed in the corner was not the nicest spot to sit. Great dinner, as usual. Our server was personable and had great recommendations. He was busy with several tables but really worked hard to keep everyone moving. Sushi was fresh and tasty and the wine recommendation was great. very casual atmosphere. Service was slow but pretty good. The food was good. Busy night but great experience overall. Our server Kendred was excellent. Went here for Valentines Day. My husband ordered a sushi combo platter. The waiter told us three times they were running behind with it. I got my meal and finished it. He never got his food. We asked for the check after an hour and left to get him something to eat at another restaurant. Not a happy occasion. Will not be returning. A talented staff, fresh vegetables, and a colorful atmosphere. The food was amazing and the experience was nice, but our server just never seemed to pay attention to our table. Our food came out at different times, almost a half hour apart from the first dish to the last. It was unfortunate that some people had to watch others eat while patiently waiting for food. After eating, our server didn't drop our checks for nearly an hour; Only after one of our party went to find her. Great, fresh sushi. Significantly different from the one on campus, much more upscale, more variety. Very flavorful, fresh food. Wonderful service and environment. One our favorite places to dine! Enjoyed a nice NYE dinner with some friends. Sushi was great, as always. And the overall vibe is cool. Great service and very good food. Had a mix of sushi, Asian and American dishes. All were excellent. We go there often, but this time was especially wonderful! From the drinks, to the food to the service. Our waiter was fantastic. The entire experience was great. Food and service was outstanding. Our waiter Chris was very knowledgeable and helpful. My husband and I have never tried sushi and he made it less scary for us. Will return for sure!! KoFusion is one our favorite dining venues! Consistently fresh & flavorful menu selections with and excellent wine list. We dine here frequently and have never been disappointed! Enjoy! Excellent food, service & dining experience as always! KoFusion is one our favorite places! We have been coming to this restaurant for years and it has never disappointed. The sushi is always high quality. Just as good if not better than restaurants in any big city. This evening was dads weekend at the University of Illinois and even though they were extremely busy it did not make a difference to the quality of the food or our service. I would highly recommend this restaurant!! Excellent sushi and making as well as great Korean and seafood specialties. We got sat and then forced to move, didn’t even acknowledge it was a birthday when I put it on the reso, and our waiter kept running away from the table. Plus half our table had messed up orders. Food was good but overall it wasn’t the best experience. This is one of my favorite restaurants. However, we were there for lunch and partook of the buffet. They only had one kind of sushi available and it was not one of their better offerings. When they first started having the buffet at lunch, the food was good. Now, not so much. Their Dollar Sushi Nights on Sunday and Monday are still the best. The timing of delivery of our orders was not good. 2 people received their orders, 5 minutes later 2 more people received their orders and the Miso soup was among the last of the items to come out. Lousy timing by the kitchen in my opinion. Food was below average: Sushis and rolls were too small for the price, and noodles were mediocre. We recently traveled cross-country and found ourselves in Champaign, IL . We were tired after 3 long days of driving. We remembered a restaurant that we had tried probably 3-4 years ago but couldn't remember the name but we knew more or less where it was located. It was KoFusion and our recent meal was absolutely fabulous as was our waitress who went out of her way to accommodate us. Delicious food - and drinks. Highly recommended! Overall nice restaurant with very good service and good sushi. I recommend the dollar sushi nights as they are popular. The food here is always great. I have been here many, many times and I've never been disappointed. I had never sat outside before and it was a beautiful evening so I enjoyed that. Every time I visit I generally go to this restaurant. I’ve happily been here many times but this visit was not good. The service was ok at best, the prices were higher than the last time I was here, and the food was “off.” It’ll be a while until I come back. The special rolls were yummy, and our server Ciara was just great! The food is consistently good and the service is always dependable. This is the best outdoor dining spot downtown and perhaps anywhere in Champaign Urbana. Rolls were very good. The "hot rolls" did not have as much heat as we hoped, but we're very good. We had a nice bottle of rose and the service was excellent. Highly recommend for a "downstate" sushi restaurant. Celebrated Mother’s Day and had our 4 year old with us. Our server was amazing and also attentive to our toddler’s needs which made our visit great that night (the food is *always* awesome, that’s why we come so often!). Your restaurant is our top recommendation to friends and family from out of state and our favorite place to celebrate social occasions! We had a fabulous meal to celebrate our sons graduation! Everyone loved what they ordered! Atmosphere was very nice and waitress and service were fantastic! We were a family of 20 for graduation party, they gave us a private room which was nice and quiet but the tables’ setup was just simple , overall the private dining room was more like a meeting room than a dining room, no ambiance . No flower or wine glasses . They could have done better to decorate the tables. The private dining room is just a large room with some large tables. The service was excellent, we had 2 dedicated waitresses who attended our whole stay. The food was delicious but a bit overpriced. I’m not sure if the menu price for a large group is more expensive. Overa all, I recommend this place for a small or large groups. Our first visit to Kofusion was amazing. It didnt have the highest star rating....but it should. Far better area than Sakayana. Location, atmosphere and SUSHI were all amazing. Highly recommend and we will be back.